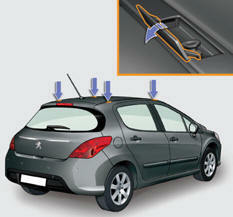 close the fixing covers on each bar using the spanner. Maximum authorised weight on the roof rack, for a loading height not exceeding 40 cm (with the exception of bicycle carriers): 80 kg. 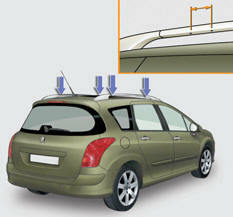 If the height exceeds 40 cm, adapt the speed of the vehicle to the profile of the road to avoid damaging the roof bars and the fixings on the roof. Be sure to refer to national legislation in order to comply with the regulations for transporting objects which are longer than the vehicle.